I received these wonderful pictures this morning from a client who had a wedding caricature drawn. As you can see from the photos, they used it as part of their wedding reception sign-in. 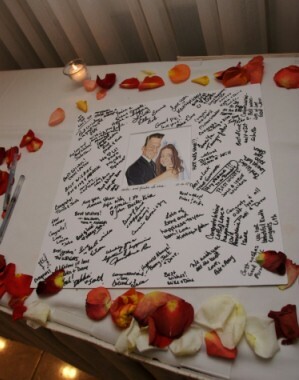 The value of a caricature as a wedding sign-in board provides many solutions. First it provides a wonderful point of focus. People are drawn to the unique image. Next, the caricature sign in board liberates people’s creativity. You know the feeling….what do I write. By having a creative image people’s brains are turned on just by seeing it and out come the witty comments. While most wedding sign in boards are formal, you may be wanting your wedding reception to have a more fun mood, and what better way than having people drawn to an image that is a little different. It really sets the tone for the rest of the evening! We can arrange a framed print with an extra wide matting for people to sign. Just let us know how wide you’d like it and we can give you a price! Because we have a range of artists, we can solve the sign-in board problem in a way that can range from bordering on formal to completely outrageous!! See our dedicated wedding singing board page. See more wedding caricature pose/theme ideas on our wedding caricatures page and our contact details where you can ask any questions you may have.